Blessings from Sheri and Gretchen! 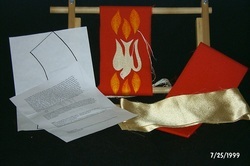 Take one of our stole kits for the pastor or seminarian in your life. Stole kits start at $40 for a blank kit and $45 for two designs. 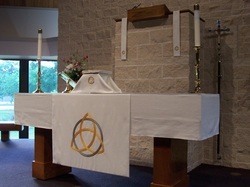 Do you need new paraments for you church? Let Sheri walk you through the creative process to craft the perfect paraments for your congregation. Pick the designs for your stole from our stole designs or submit your own. 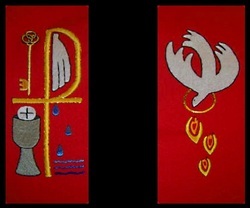 Do you want to make a personal stole for a pastor or seminarian in your life and wonder if you could actually do it? We can help you. Stole making is not as scary as it sounds. 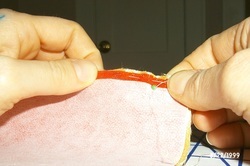 We would love to walk you through the entire process from designing to sewing it up.